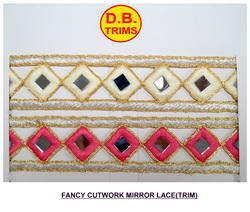 Prominent & Leading Manufacturer from Surat, we offer fancy jari cutwork lace, multi cutwork lace, golden cutwork lace, mirror cutwork lace, cut work laces and designer cutwork lace. Remembering the most recent elegant prerequisites of our regarded customers, we are putting forth a charming scope of Zari Lace. 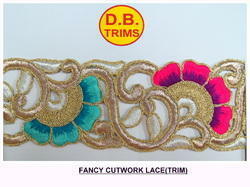 We are counted amongst reckoned names in the industry, committed towards manufacturing a wide gamut of Fancy Cutwork Lace. 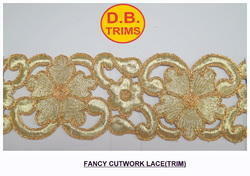 In order to keep pace with the never-ending demands of customers, we are involved in offering a wide range of Golden Cutwork Lace. 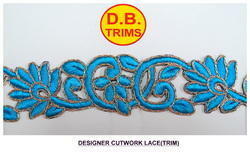 We feel immensely pleased to present ourselves as a leading manufacturer of premium quality Designer Cut Work Lace . 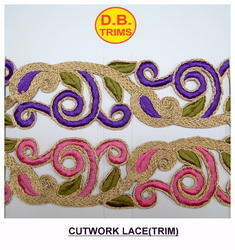 Keeping in mind ever-evolving requirements of our respected clients, we are offering a premium quality range of Cut Work Lace. 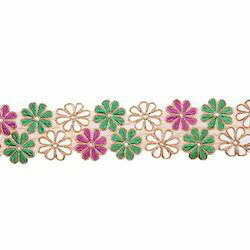 Under strict supervision of our skilled professionals, we are offering a distinguished collection of Cutwork Lace. The offered lace is widely appreciated by our clients for its alluring designs, elegant look and impeccable finish. Available in various attractive designs and stylish patterns, our offered lace is quite impressive and guaranteed of its quality. 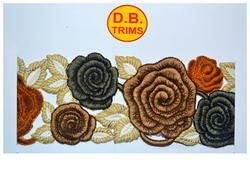 This lace can be availed from us at market leading prices. With sincerity and hard work of our professionals, we have carved a niche for ourselves in this domain by manufacturing premium quality gamut of Zari Cutwork Lace. 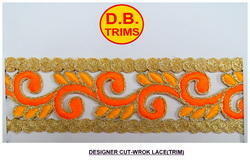 Focusing on the quality of the products, we are engaged in offering Cut Work Lace. 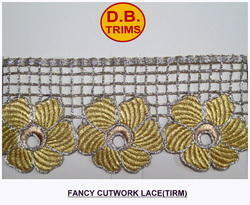 Our offered lace is fabricated using outstanding quality raw material and the most modern technology. Also to this, the offered lace is long-awaited by our clients for its graceful look and trendy patterns. Apart from this, our afforded lace is designed keeping in intelligence the client's desires.